Sunday’s Lakewood BlueClaws post-game pink jersey auction raised $5,535 for Susan G. Komen for the Cure of Central and South Jersey, the American Cancer Society’s “Strides Against Breast Cancer” and BlueClaws Charities. The auction was originally scheduled for Mother’s Day (May 9th), but was pushed back two weeks when the May 9th game went 15 innings. BlueCla ws pitcher Nick Hernandez’s jersey went for $800, the highest bid of the day. The team’s next jersey auction will be held on June 17th, when the BlueClaws host a BlueClaws World Cup jersey auction on Soccer Night. The team will also host jersey auctions on July 10th (BruceClaws on Bruce Springsteen Appreciation Night) and July 29th (Goonies jerseys on 25th Anniversary of the Goonies Appreciation Night). Charities can receive a portion of the proceeds from a BlueClaws jersey auction through the team’s Community Partners Program. Interested area non-profits that take part in a BlueClaws fundraiser receive exposure through the team’s game program plus stadium signage. Community Partners can then apply to receive additional money through the program. Interested charities can contact Jim DeAngelis at 732-901-7000 ext 114 or email jdeangelis@blueclaws.com. 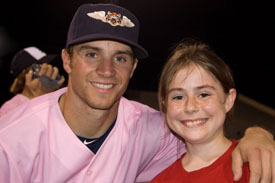 BlueClaws Charities contributed over $150,000 to area non-profits and fundraising events in 2009. The Lakewood BlueClaws are in their 10th season of providing family fun and entertainment at the Jersey Shore. The BlueClaws, who won the South Atlantic League title in 2009, have led the league and New Jersey in attendance in each year of existence. 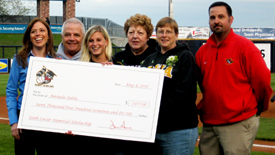 In a moving ceremony during Saturday night’s River Bandits game at Modern Woodmen Park, Amanda Stahle was introduced as the recipient of the inaugural Keith Lucier Memorial Scholarship. Her first full year as a student at the University of Iowa will be funded by the Bandit Scholar Program when she embarks on her college career next fall in Iowa City. Stahle, a senior at Bettendorf High School was selected from an impressive pool of applicants from the Quad Cities area that are planning on heading to Iowa for their college studies. Based on the application and interview process, conducted by a committee consisting of Keith’s family, friends and co-workers, it was determined that Stahle most exemplified the type of person that Lucier was. She is extremely active in education, athletics and community involvement. All qualities that were critical in selecting the ideal candidate for the scholarship. This year’s scholarship reflects the beginning of the Bandit Scholars program. 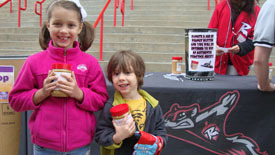 Bandit Scholars was founded by River Bandits owners Dave Heller and Bob Herrfeldt and it is funded by fan donations and fund-raising efforts by the River Bandits. The Lucier Scholarship is named for former River Bandit assistant general manager, Keith Lucier, who passed away suddenly in April, 2009 from a brain aneurysm. It is an annual scholarship that is designed to give a Scott County student free tuition for their first year of school at the University of Iowa and a summer internship with the River Bandits. Giving back and supporting local charities is important to any sports organization, and the Stockton Ports are no different. The Stockton Ports were asked to take part in the Go Red for Women Luncheon on April 29, 2010 at The Hilton Stockton to help raise money and awareness for Go Red for Women and the American Heart Association. The luncheon provided a Healthy Lifestyle Expo & Boutique, Breakout Session, Keynote Speaker Neha Sangwan, Survivor Speaker James Niskanen, and Master of Ceremonies Jennifer Smith of News 10. The Ports players took part in the luncheon portion of the event and provided a lot of smiles and laughs for all in attendance. 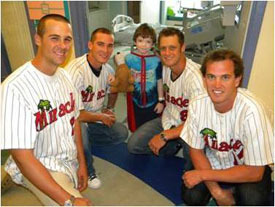 The players had the responsibility of collecting donations during the lunch. But the fun part was what happened once the donations were collected. The boys were provided with red feather boas. Each person who donated received a boa from one of the players. 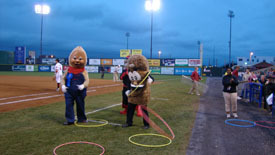 It was a fun way to get the crowd smiling and gave them a way to interact with the Ports. Eight Ports players were involved in this wonderful event: catcher Ryan Ortiz, pitcher Kenny Smalley, pitcher Scott Deal, pitcher Trey Barham, catcher Dusty Napoleon, pitcher Paul Smyth, shortstop Grant Green, and designated hitter Kala Ka’aihue. Wide-eyed and full of questions, local junior varsity and varsity baseball coaches at the high school level get a rare, intimate look into the life of minor league coaching. Hours before gates open at Banner Island Ballpark, prior to a 7:05 p.m. first pitch, local coaches were able to step inside the front gates for a lesson of a lifetime. The coaches look around in awe at the ballpark, hoping their young, developing players can make it to that level one day with the help and guidance of their coaching. Once everyone was in the ballpark, all the coaches were led down to the Ports dugout. Not just anyone gets the chance to be in a minor league dugout. It is a close, rare look at the field that only the players and coaches have the chance to experience. Once in the dugout, the men were greeted by Stockton Ports Manager Steve Scarsone. Scarsone has been in the baseball world for a long time and had a lot of great coaching advice to give the local coaches…Don’t focus so much on the upper part, make sure your lower half does most of the work, take playing catch seriously, have them do drills, and most importantly, explain to them why. That is just some of the advice that Scarsone bestowed upon the coaches in the hour session they had in the dugout. The men asked questions and received detailed answers and examples from the seasoned coach. After the hour talk was finished, Scarsone had to get back to batting practice with his team. The coaches weren’t finished yet, though. 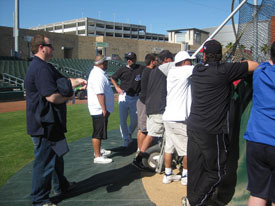 The men were then led behind homeplate and were able to watch a minor league batting practice up close and personal. Scarsone was still there to answer any questions that the coaches had. In order for the coaches to attend the Ports Coaches Clinic, they had to purchase a ticket to that night’s game against the Bakersfield Blaze. So once their coaching lesson was over, their minor league experience continued with the Ports game. They were able to see all of Scarsone’s coaching advice play out right in front of them on the field. 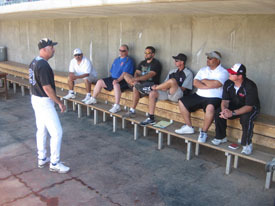 Ports Manager Steve Scarsone talks with some of the local coaches in the Ports dugout. Scarsone gives out more advice to the coaches on the field.